What changes make the 2018 Audi Q5 different? A full redesign, including a fresh body on a new underskin structure, plus updates to powertrains, safety, and technology. These sweeping changes launch the second-generation of this German automaker’s most popular vehicle. When it premiered for model-year 2009, the Q5 took the burgeoning premium-compact-crossover SUV market by storm. It became Audi’s top seller virtually overnight as shoppers flocked to its compelling blend of passenger and cargo room, top-notch driving dynamics, and an interior design that would be at home in a much more expensive vehicle. Riding the wave it helped create, Q5 demand rose 27 percent in the first quarter of 2017, as premium-compact-crossover-class sales increased 50 percent. Sales were up for nearly every entry in the segment, and the class expanded with addition of the Buick Envision and Jaguar F-Pace, which have proved popular. The Q5 trailed only the Cadillac XT5 and BMW X3 and in the sales race and was ahead of such rivals as the Acura RDX, Envision, Lincoln MKC, Mercedes-Benz GLC, and Volvo XC60. Why should I buy a 2018? To get an all-new crossover that’s slightly larger, yet more powerful and lighter than its 2009-2017 predecessor. The Q5 again slots into Audi’s crossover lineup between the subcompact Q3 and the larger, seven-seat Q7. More extensive use of aluminum for the hood, liftgate, and other underbody components helps reduces curb weight slightly, offsetting gains in vehicle size and the addition of more standard features. The ’18’s exterior appearance will look fresh for years to come, and the revised cabin continues as a segment benchmark for materials and design. 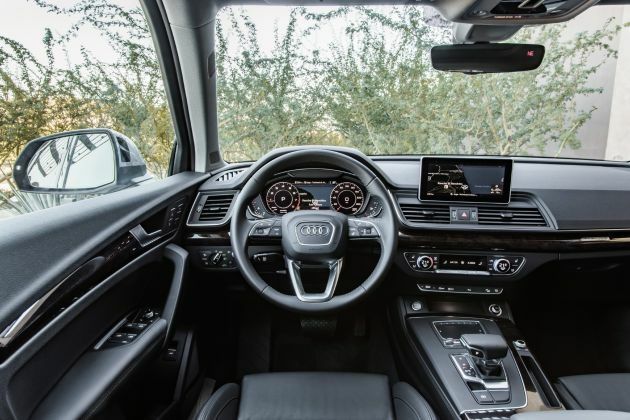 Making their Q5 debuts with the 2018 redesign are such features as an adaptive suspension and Audi’s high-tech Virtual Cockpit instrument cluster. Note that the 2018 redesign further separates the Q5’s basic design from that of the Porsche Macan. Porsche and Audi are part of the Volkswagen Groupe and today’s Macan continues to be based in part on the understructure of the first-generation Q5. Audi’s 2018 Q5 lineup consists of 2.0T models with a turbocharged four-cylinder engine and the performance-oriented SQ5 with a turbocharged V-6. Both come in Premium Plus and Prestige trim levels, with 2.0T versions anchored by a base Premium grade. Audi’s quattro all-wheel drive (AWD) system is standard on all. Should I wait for the 2019 model instead? Probably not, given that it’ll be a virtual repeat of the 2018, but will likely cost more. Audi could shuffle some equipment among models, but hardly to a degree worth putting off purchase of a 2018 model. If, however, you like the Q5’s basic design but hanker for something with a bit more visual flash, you might want to delay purchase of an ’18 pending Audi’s decision about a new crossover, forecast as the Q4. Wearing a sporty, coupe-like four-door body, it would fill the gap between the Q3 and Q5 and give Audi a competitor for similarly sized crossover fastbacks like the BMX X4 and Mercedes GLC300 4Matic Coupe. Yes, but not drastically so, despite the all-new body. The look is clean and simple, but more aggressive than the original’s. The most obvious change is the more sharply defined front end, where the Q5 adopts the sterner design language of other recently redesigned Audis, including the 2017 A4 compact sedan and 2017 Q7. A wavy crease enlivens the body sides and more pronounced wheel arches re-emphasize the standard all-wheel drive. Exterior dimensions are almost identical to the first-gen model, though a half-inch-longer wheelbase (distance between the front and rear axles) and a .9-inch longer body contribute to slight increases in rear-seat legroom and cargo volume, both of which were already above average for the class. The rear seat now slides fore and aft. A power liftgate is standard and, on Premium Plus and Prestige models, gains hands-free opening and closing by sweeping your foot below the rear bumper. Bolder horizontal bars tart up the SQ5 grille’s grille and front air intakes, bifurcated dual-exhaust outlets help identify it from the rear, and its exclusive, “double spoke” 20-inch alloys are offset by red brake calipers when you order the $3,000 S Sport Package. Twenty-one-inch alloys with summer performance tires are a $1,000 SQ5 option. Interiors are again cutting-edge cool. Q5s come with leather upholstery and a choice of three real wood or aluminum inlays. SQ5s feature a combination of leather and Alcantara upholstery with front sport seats and brushed aluminum trim. They also have a trendy, flat-bottom steering wheel. Mimicking that of the A4 and Q7, the control layout incorporates the latest version of Audi’s MultiMedia Interface (MMI) infotainment system. Its upgraded hardware makes operation faster and more responsive to user inputs. Using a crisp 8.3-inch dashboard screen, the system employs a touchpad that supports tablet-style gestures and handwriting recognition. An available Virtual Cockpit replaces the Q5’s standard analog instrumentation with a single 12.3-inch LCD screen. The display can be configured in a multitude of ways, including the showing of traditional gauges or a high-resolution, full-screen map view from the available navigation system. Yes, to engines, all-wheel-drive systems, and suspension. Gone is the Q5 3.0T model, with its 272-horsepower supercharged V-6. Discontinued as well is the 2017 Q5 gas-electric hybrid model. The engine in the 2018 Q5 2.0T range is again a 2.0-liter turbocharged four-cylinder, but now with 252 horsepower and 273 pound-feet of torque, increases of 32 and 15, respectively. Instead of an 8-speed automatic transmission, it now pairs with a 7-speed dual-clutch automatic. The effect of this upgraded 2.0T powertrain is highly satisfying. If you’re aggressive with the throttle coming away from a stop, it can suffer the slightest lag before delivering real power, but acceleration is strong thereafter. Audi quotes 0-60 mph in 5.9 seconds. That’s good for this size vehicle with this sort of powertrain and is a full 1.1-seconds quicker than the previous Q5 2.0T. The SQ5 again has a 3.0-liter V-6, but instead of supercharged, it’s now turbocharged. Horsepower remains 354 but torque increases to 369 pound-feet, from 346, and it now peaks at just 1370 rpm, down from 4000 rpm. This hot-rod crossover continues with a conventional 8-speed automatic transmission. The result is impressive by most any measure, with robust thrust from virtually any speed and acceleration that feels quicker than Audi’s promise of a brisk 5.1-seconds 0-60. Audi’s quattro AWD system is standard, but the Q5 2.0T range gets quattro with ultra, a next-generation setup intended to improve handling and fuel efficiency by running in front-wheel drive when AWD isn’t needed. Instead of channeling power to the rear wheels via a center differential, it employs two clutches, one inside the transmission, the other in the rear axle. In addition to being lighter, it allows the rear wheels to be disengaged from the drivetrain when they don’t require power. Computer control engages the rear wheels – sometimes anticipating actual tire slip, to provide extra traction on slippery surfaces or during acceleration or cornering. It performs seamlessly. The ’18 SQ5’s quattro system again constantly apportions power front to rear, depending on available traction and myriad computer assessments of driving parameters. The torque-vectoring limited-slip differential included with the S Sport Package can set nearly 100 percent of the engine’s power to just one rear wheel. Newly available as a $1,000 Q5 option is an adaptive damping suspension with driver-adjustable comfort, normal, and sport suspension settings that optimize ride comfort and control while reducing body lean during cornering. 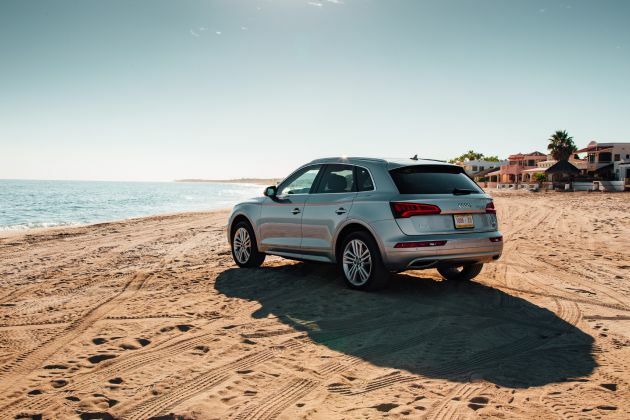 Both models have 8.2 inches of ground clearance, but the air suspension that’s part of the SQ5’s S Sport Package can lower that to 7 inches to aid handling, raise to an off-road friendly 9 inches, or drop it to 5 inches to make cargo loading easier. SQ5s, especially on the summer performance tires, deliver exceptional grip in turns, but any 2018 Q5 handles with surefooted composure. Demerits include the noseplow in tight fast corners that betray this platform’s front-drive DNA. And the steering can be disappointingly numb; even the standard “drive select” system’s adjustable steering effort seems mostly to simply decrease power assist. On the upside, every Q5 and SQ5 rides firmly but with an absorbent composure; here, the stiff new structure is an obvious ally. Yes, and while the gains aren’t great, remember the power and performance advances of the 2018 Q5 and SQ5. EPA fuel-economy ratings for the 2018 Audi Q5 2.0T are 23/27/25 mpg city/highway/combined. That compares with the outgoing Q5 2.0T’s rating of 20/27/22 mpg. The ’18 SQ5 rates 19/24/21 mpg, versus its predecessor’s 17/24/19. All ’18 Q5 and SQ5 models require premium-grade 91-octane gasoline. Yes, highlighted by added driver aids that bring the ’18 Q5 abreast of top rivals for expected safety features. The previous Q5 wasn’t available with forward-collision warning, pre-collision braking, lane-departure warning, or lane-maintaining steering assist. By contrast, every 2018 Q5 and SQ5 comes standard with the Audi “pre sense city” system of autonomous emergency braking that can stop it automatically to avoid a collision with another vehicle or a pedestrian. Disappointingly, however, Audi falls short of providing every 2018 Q5 and SQ5 with the full suite of safety systems expected of a premium-priced crossover. For example, blind-spot and rear-cross-traffic detection are standard – but only on the Premium Plus and Prestige trims. Adaptive cruise control to maintain a set distance from traffic ahead, automatic low-speed traffic-jam stop-and-go, and lane-maintaining automatic steering are limited to top-line Prestige versions — and then only as part of the $1,800 Driver Assistance Package. The package also includes automatically dimming high-beam headlights and automatic braking when turning left in front of an oncoming vehicle. Absence of autonomous emergency braking helped keep the previous Q5 and SQ5 ineligible for the industry’s most coveted accolade, “Top Safety Pick+” status from the influential Insurance Institute for Highway Safety. The institute also considers headlamp performance among its criteria; as of this review, it had not yet published test results on any 2018 Q5 model. Credit Audi with providing all models with the aforementioned interior amenities and performance-enhancing items. And while the automaker cuts no corners on infotainment tech or comfort and convenience features, many desirable items are optional. For example, Premium-model buyers must pay $500 for heated front seats and need the $900 Convenience Package to get power-folding mirrors, power front seats with driver memory, keyless entry with pushbutton start, and satellite radio. Cooled front sport seats are part of the Warm Weather Package, a $1,450 option on 2.0T models and a $1,250 option for SQ5s (where it also includes Milano leather). The Cold Weather Package with a heated steering wheel and heated rear seats is a $500 option across the board. A panoramic moonroof is standard on Premium Plus and Prestige trims and a $1,450 option for the Q5 Premium. The navigation system with its 8.3-inch screen and Audi Virtual Cockpit is standard on Prestige trims and an option, at $3,000, for the Premium and, at $2,600, for the Premium Plus grades. Among SQ5s options are dynamic steering, at $1,150, which varies the steering ratio based on vehicle speed and the Audi Drive Select setting. How are 2018 prices different? Base prices increase, from just $625 for the Premium 2.0T — modest, considering this second-generation Q5’s thoroughly upgraded design – but by a more substantial $2,375 for the more popular 20.T Premium Plus. The SQ5 Premium Plus is up $1,025, but the starting price of the SQ5 Prestige actually falls by $2,275. 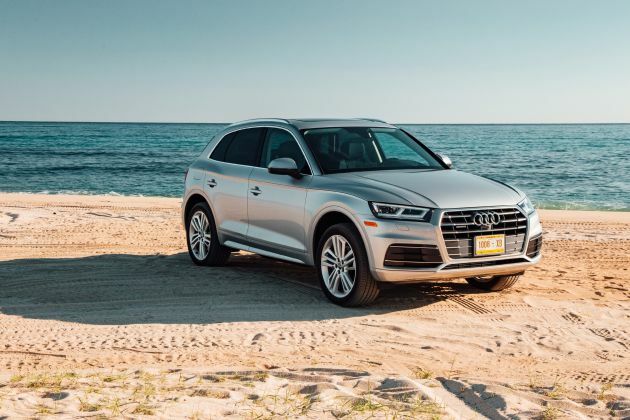 Base prices in this review include Audi’s $975 destination fee, and overall, they remain competitive with those of key rivals, although as you can see from the options-package charges noted above, bottom lines can escalate quickly. Prefer any exterior color other than white or black, for example? That’ll be an additional $575. A 2.0T Premium Plus in Matador Red Metallic with 19 inch wheels, navigation, and the Cold Weather Package lists for $50,150. In the 2.0T line, the price-leader 2018 Premium starts at $42,475, the Premium Plus at $46,475, and the Prestige at $51,775. The SQ5 Premium Plus is priced from $55,275 and the SQ5 Prestige from $59,475.